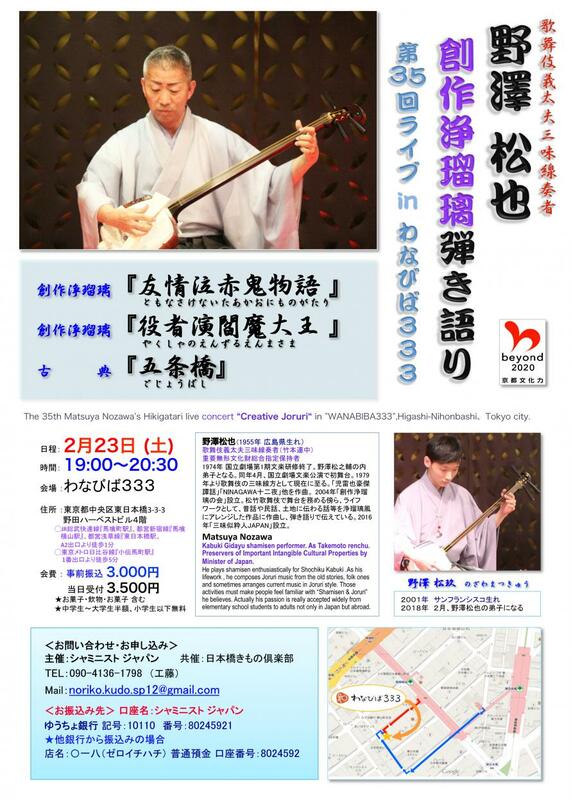 The 35th Matsuya Nozawa's, Hikigatari ( sing and play shamisen ) live concert “Creative Joruri“ in WANABIBA333,Tokyo city. Japanese traditional culture save the earth !! Kabuki Gidayu shamisen performer . As Takemoto renchu (Takemoto company). Preservers of Important Intangible Cultural Properties by Minister of Japan. He plays shamisen enthusiastically for Shochiku Kabuki . As his lifework , he composes Joruri music from the old stories, folk ones and sometimes arranges current music in Joruri style. Those activities must make people feel familiar with “Shamisen & Joruri” he believes. Actually his passion is really accepted widely from elementary school students to adults not only in Japan but abroad. !